Home • Pet Blog • What is specialty care? In human medicine, patients see their family doctors for routine wellness checks and general health concerns. But often, the primary care doctor recommends a specialist. The same is now true of veterinary medicine. 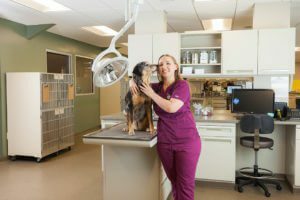 Like their human medical counterparts, veterinary specialists are doctors of veterinary medicine who choose to specialize in one area of medicine, surgery or specific species. 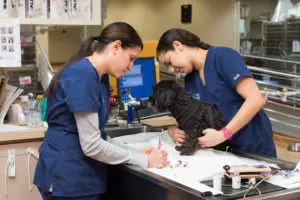 In addition to undergraduate training and four years of veterinary school, specialists also complete an internship and residency in their specialized field which involves an additional three to five years of training. To be board certified, they pass an exam at the end of their training. A primary care veterinarian may recommend a specialist if your pet has a complicated problem that requires advanced training, expertise, skill or equipment for diagnosis or treatment. Every day, specialists at BluePearl perform procedures once reserved only for people, including chemotherapy and radiation therapy for cancer, knee and back surgeries, a cataract removal, and dialysis for kidney problems. They play an important role in the management of chronic conditions such as diabetes, heart disease, intestinal disease, allergies and skin problems. In addition, veterinary surgeons are highly skilled at procedures that range from the routine to the complex: extracting foreign objects, repairing fractures and lacerations, and removing tumors. Our specialty teams work closely with family veterinarians and pet parents to develop the best possible treatment plan for each patient. We strongly believe this collaborative approach to care leads to better outcomes. This respect for the bond between patient, pet parent and family veterinarian, combined with our years of experience and compassion, have earned BluePearl a reputation for excellence.